In this report, we examine the latest version of the highly regarded World Economic Forum “Global Risks Perception Survey”. The report is based on a survey of more than 1,000 experts and decision makers around the world and is released ahead of the WEF’s Annual Meeting in Davos. As well as identifying potential dangers facing the world in the coming year, the report urges governments and organisations to address the impact of specific threats and make preparations to contain potential fallout should they occur. During the last 12 months, rising political and social unrest as well as disruptive shifts in technology created additional risks and instabilities which had a direct impact on businesses operating globally. A number of the top 10 global risks which were forecast for 2018 remain a concern and some are certain to feature prominently in this latest outlook. However, for 2019, there has been a shift in the staging order regarding where those risks identified for 2018 are now placed in terms of likelihood and impact to businesses across the world, and how more than ever they are growingly intrinsically linked. China continues to focus heavily, with economic decline and the repercussions of this impacting the global stage across a number of industries. Given the importance of China as a market, a source of global investment and a manufacturing base, a continuing economic downward trend could have profound global effects. Demand for exports has lowered and there have been several foreign companies scaling back their operations or divesting interests altogether, as we have witnessed with the automobile industry. Relations between China and the US continue to remain under sharp focus, particularly in light of recent events involving America's neighbour, Canada. Arguably, China and the US remain one of the world's most important and influential bilateral relationships, and despite an apparent ‘thaw’ regarding trade ties during the G20 summit in Buenos Aires late last year, it is difficult to foresee any improvement in the relationship between Beijing and Washington during 2019, regardless of what happens to the economic and trade situation. When this is combined with protectionist trade moves against Europe, it is clear that international tensions will continue to feature heavily on the global geopolitical landscape for 2019, resulting in less cooperation between major powers. This outcome will further inhibit the collective progress on important global challenges and is likely to weaken already fractious security alliances, which in turn would undermine efforts to protect the global commons. Although the risks associated with rising geopolitical tensions among the world’s major powers is generally played out in the economic field, there is a growing expectancy that future escalations in tension could potentially spark an increased risk of political confrontations between major powers. For example, although it is highly unlikely either China or the US would willingly enter into direct military confrontation over any of the current issues straining their relationship, an incident such as a collision in the South China Sea could potentially become a full-blown foreign-policy crisis. The two countries in the past have successfully diffused the situation after several such near-crises, including the collision between a US spy plane and a Chinese fighter in 2001. Doing so again in today’s climate would be far more challenging. Each year, the GRPS looks at which risks are viewed by global decision makers as increasing in the coming year. It is clear from the results that economic risk is at the forefront of expectations for the year ahead, as shown below with the top two issueswhere risk is expected to increase being economic confrontations/frictions between major powers, and the erosion of multilateral trading rules and agreements. Although there does seem to be a general view that the breakdown of geopolitical cooperation is influencing risk outlooks for 2019, with trade wars compounding the issue of already weakening economies, this divergent geopolitical climate may also be a driving factor in what is forecast as the biggest global risk in 2019; extreme weather. As the relationships between the major powers continue to erode, so does the world’s ability to confront issues like climate change and the associated extreme weather. 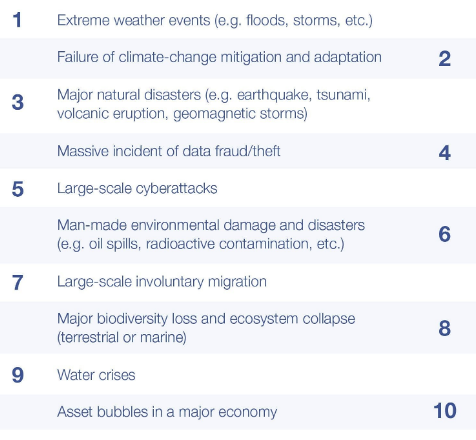 According to the WEF, climate change risks are at their highest-ever level, accounting for more than half of the top 10 risks. 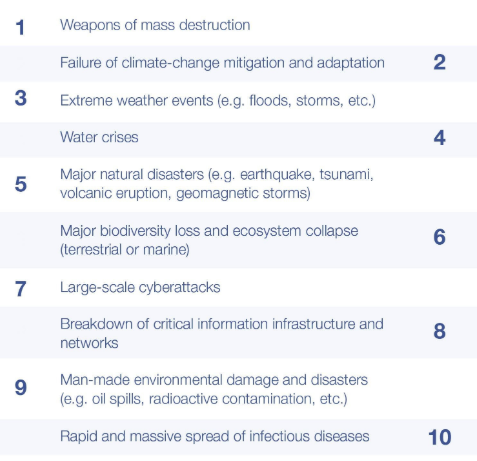 When we examine the WEF GRPS for 2019 and breakdown the top 10 risks by likelihood, impact and interconnections; environmental threats dominate the list for the third year in a row, although now at a higher ranking than ever before. As the results of the report reveals, these risks overlap and are interconnected with regard to their potential to influence and affect other risks within the chart. As we’ve already seen, the growing inability of the major powers to work together to achieve common goals is having a profound impact on climate change, which in turn is claimed to be driving the extreme weather phenomenon we are experiencing. Looking back over 2018, extreme weather events, such as hurricanes Michael and Florence in North America, Typhoon Jebi in Japan and increasingly devastating wildfires across California resulted in economic losses totalling around $146 billion (Swiss Re, December 2018). This was also on the back of record losses to date in 2017 as a result of extreme weather and natural catastrophes. This in turn can also have wider implications, as more stringent measures are introduced by those countries attempting to mitigate the risk posed by climate change. Increased regulation, more strict emissions targets and a greater emphasis on liability are already impacting certain industries, particularly within aviation, shipping and the automobile industry. Technological solutions are widely being sought to combat many of our modern day challenges, such as climate change mitigation and adaption. However, as this level of technological reliance increases, it also raises risk surrounding cyber security, data protection, business continuity and third party liability, as well as the potential for critical infrastructure breakdown. Unexpected consequences continue to materialise, such as drone activity cancelling some 1,000 aircraft at the UK’s Gatwick airport in December 2018. The costs and brand reputational damage associated with cyber-attacks are certain to have some bearing regarding why cyber risks feature so prominently in the 2019 report. According to Allianz Global Corporate & Specialty (AGCS), the average insured loss from a cyber incident is now just over €2 million, compared with almost €1.5 million from a fire/explosion incident. When you take into account that many modern global companies have their primary assets or business model heavily reliant on digital services and technology, it is clear to see why new instabilities are being caused by the deepening integration of digital technologies. Industry average claims for losses as a direct result of cyber incidents now exceeds $100 million and this is expected to increase during 2019. Malware attacks such as the WannaCry and NotPetya attacks of 2017 highlight just how damaging cyber incidents can be, disrupting shipping, logistics and manufacturing across multiple industries and on a global scale. Finally, a growing area of risk concern within the cyber theatre is that posed by the increasing emergence of Artificial Intelligence (AI) and its growing use in our everyday lives. Although still in relative infancy, as AI technology continues to develop and become more intelligent and sophisticated, it is likely we will see new risks emerge along with measures to mitigate their impact. 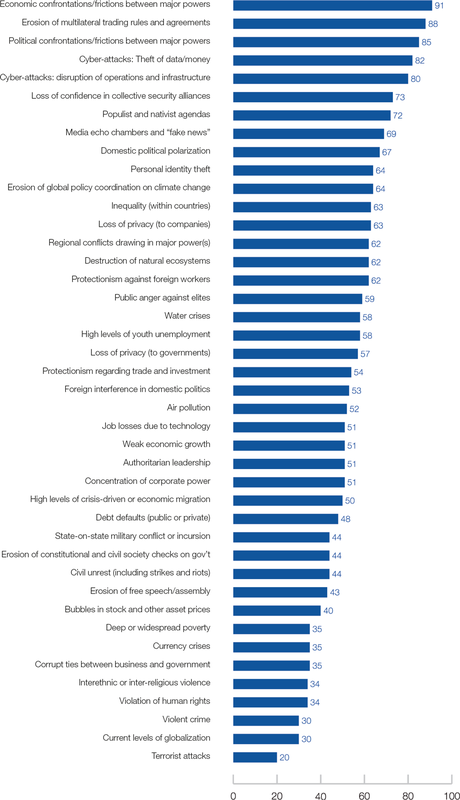 AI is also highlighted within the WEF GRPS as being complicit in the rise of “media echo chambers and fake news” and there is an expectation this will increase across the majority of those surveyed.